I have seen this drama a while back and just recently watched it again. It’s a really good drama and I don’t know why I have forgotten about it. 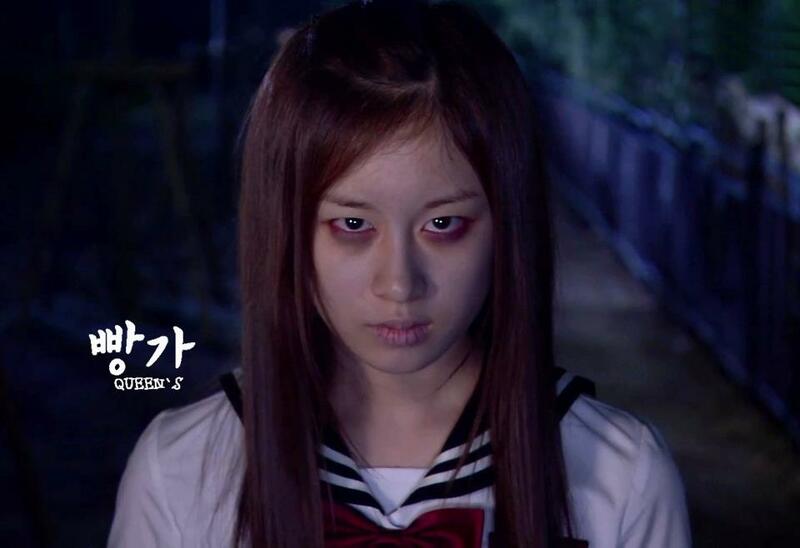 I would say that if you saw Master’s Sun, then it would be a much more serious and creepy version of that. This movie is full of deep dark secrets, revenge and murder. It is something we fear in society. The story is about a girl, Ha Na who seemingly lives a normal life until her twin sister Doo Na dies in a fire. She has always had a tragic past and after her sister dies, her life changes for the worst. It is not one of those happy dramas that ends well. It’s not for the faint hearted either. It’s pretty gory up to the end. It’s really sad how the entire story ends because everyone would have had a happy life if it wasn’t for a few key individuals that made it miserable for them. Many people ended up losing their lives. The tragic events started happening right after a girl at their high school commits suicide during Ha Na’s gym class. Before that, she had had an argument with Joong Chan (he’s the school bully). Later on it is revealed that Joong Chan and his friends sexually harassed her in an abandoned warehouse. Ha Na overheard their conversation. Later on, Ha Na finds the girl’s phone on the roof where she jumped. On it is a video of the boys harassing her. Joong Chan finds out that she has the phone and threatens Ha Na by kidnapping Doo Na. Instead of letting her go, he sets a fire in the warehouse and Ha Na fails to save her. Her mother also ends up dying because she finds out who really killed Doo Na. Fear of fire is an important theme in this show. Ha Na had an unfortunate incident when she was at a children’s retreat. A fire was set (later it was revealed that Joong Chan’s father, Baek Do Shik set the fire so that he could buy the land) and all of the children there died except Ha Na. Ever since that incident, she is afraid of fire. So when Doo Na dies in a fire, this really terrified her. Also, I forgot to mention that Shin Ryu (the main character in the show) is connected to Baek Do Shik in some way. When Shin Ryu was younger, he wanted to help a trouble maker from his school. This act of kindness ended up killing his sister (So Yi) and eventually his mother also dies by hanging herself. Baek Do Shik was the lawyer that set So Yi’s killer free. We then find out that the guys who work for Baek Do Shik are the same guys who caused So Yi’s death. Shin Ryu started out as a nice kid who only saw good in people. After his family dies, his view of the world changes and he ended up being a criminal profiler. He now thinks that some people are not people at all an are evil in nature. His ex girlfriend, Hye Won has a different opinion of people. She is part of a program that rehabilitates criminals so that they won’t do any more bad things. Shin Ryu completely disagrees with what she does. Later in the series, Ha Na ends up possessed by Doo Na and Shin Ryu uses Ha Na to punish people who cannot be punished by the law. One too many times he has seen criminals go free. At first Ha Na doesn’t know that she is being used and she doesn’t remember anything. In reality, Ha Na doesn’t actually kill anyone. She instills fear in those who have done wrong and this causes their deaths. After some time, Shin Ryu hypnotizes Ha Na and erases her memory of all the bad things that have happened. The show then goes forward two years and we see Ha Na as a happy girl who doesn’t remember anything from her sister’s death. However, this doesn’t last long because she gains her memory back with the help of Baek Do Shik. Of course, this is never a good thing. He lies to her and tells her the Shin Ryu was the one who started the fire at the retreat and killed her family. And while all of this is going on, there’s news of a new serial killer who only kills white collar citizens. They call him The Judge. We can already guess who The Judge is. It’s Shin Ryu. The irony of it all make this very sad. In one scene Ha Na asks if things would be able to be normal again. It never really returns to normal. Her friends and family end up dead by the end of the show. But even though it was really sad up to the end, I still enjoyed it because I’m a huge horror genre fan. If you are too, then you will definitely enjoy this.